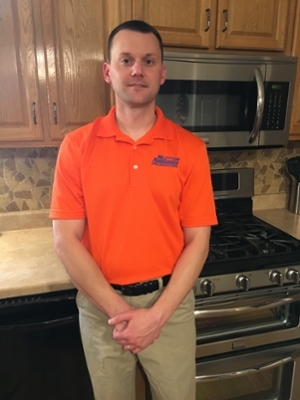 United States Air Force veteran Chad Grubofski is preparing to open Mr. Appliance of Mid-America, a Metro East-based franchise of a major appliance repair company, in early June, thanks to business plan expertise provided by the Illinois Metro East Small Business Development Center at Southern Illinois University Edwardsville. The Shiloh resident’s Mr. Appliance of Mid-America franchise will serve residential customers from Edwardsville south to Waterloo and east to Lebanon. Grubofski’s franchise is the only one in the Metro East and will serve a population radius of more than 140,000 households. Dishwashers, stovetops, ovens, refrigerators, washers, dryers and other appliances are among Mr. Appliance’s fortes when it comes to repair. Such is the business plan of Mr. Appliance of Mid-America. Grubofski’s competitive edge will be same-day or next-day service, paired with a one-year guarantee on all parts and service. “Our objective is to truly engage with customers and not just be an in-and-out repair company,” he said. As home appliances continue to become more sophisticated and in need of computerized diagnostics, it’s more difficult for homeowners to make their own repairs. “Like automobiles, appliances have more complex technology built into them than in the past,” Grubofski said. The Illinois Metro East SBDC began assisting Grubofski in February. SBDC Interim Director and Small Business Specialist Jo Ann DiMaggio May met privately with Grubofski, assisting him in fine-tuning his business plan so he could seek funding. The SBDC also connected Grubofski with an attorney specializing in business start-ups. Thanks to the SBDC’s expertise, the new franchise owner said he was able to secure a sizable commercial loan from PNC Bank. Di Maggio May is currently working with Grubofski on developing an employee handbook. Di Maggio May said working with Grubofski has been gratifying, because he is a hard worker who has a clear vision of what he wants his franchise to be and how he plans to serve Metro East homeowners. Customers will be able to contact Mr. Appliance of Mid-America online to set up their appointments via the franchise’s website, mrappliance.com. Customers are also welcome to call the company at (618) 213-3030 to request a repair day and time. Customer service representatives are available 24/7. The Illinois SBDC at SIUE assists new businesses such as Mr. Appliance of Mid-America and existing businesses headquartered in the nine-county Metro East region of Calhoun, Jersey, Madison, Bond, Clinton, St. Clair, Washington, Monroe and Randolph. It is a no-cost service to the community supported by the U.S. Small Business Administration, Illinois Department of Commerce and Economic Opportunity, and Southern Illinois University Edwardsville. By aiding entrepreneurs and companies in defining their path to success, the SBDC network positively impacts the Metro East by strengthening the business community, creating and retaining jobs and encouraging capital investment. It enhances the region’s economic interests by providing one-stop assistance to individuals by means of counseling, training, research, and advocacy for new ventures and existing small businesses. When appropriate, the SBDC strives to affiliate its ties to the region to support the goals and objectives of both the SIUE School of Business and the University at large. To learn how the SBDC can help your small business, contact the Metro East SBDC at (618) 650-2929 or sbdcedw@gmail.com. Photo: Chad Grubofski is preparing to open his new franchise, Mr. Appliance of Mid-America.